Recorded September 25, 2004 at Saint-Barthélemy d'Anjou at home studio. All these pieces were improvised and were performed without re recording, only with traditional acoustic percussion instruments. 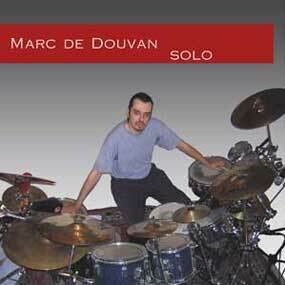 All the extract titles come from traditional rhythms and polyrhythms (normally played by several percussionists), with an original orchestration ("arrangement") by Marc de Douvan, for modern drumset solo. Note the complex rhythms played in independence with the left foot (with bell hitted by bass drum pedal, bass drum double pedal and hi-hat pedal). Many phrases used in these extracts are described (written and explained) in my method for advanced level: "Return to the Sources" .